I’ve made a few different raw Marinara sauces over the past year and I have to say this is my favourite and the kids agree. I am not sure if it is the quantity of sun-dried tomatoes to fresh or the addition of the savoury yeast or simply adding of a date to the sauce – but this is a really yummy raw tomato sauce. I had mine with spiralled zucchini and the kids have theirs with ordinary pasta. Everyone was happy! Combine all ingredients including 1/4 cup water in a high speed blender and blend until combined. Add more water a couple of Tablespoons full at a time until it reaches your desired consistency. The sauce should be quite thick. 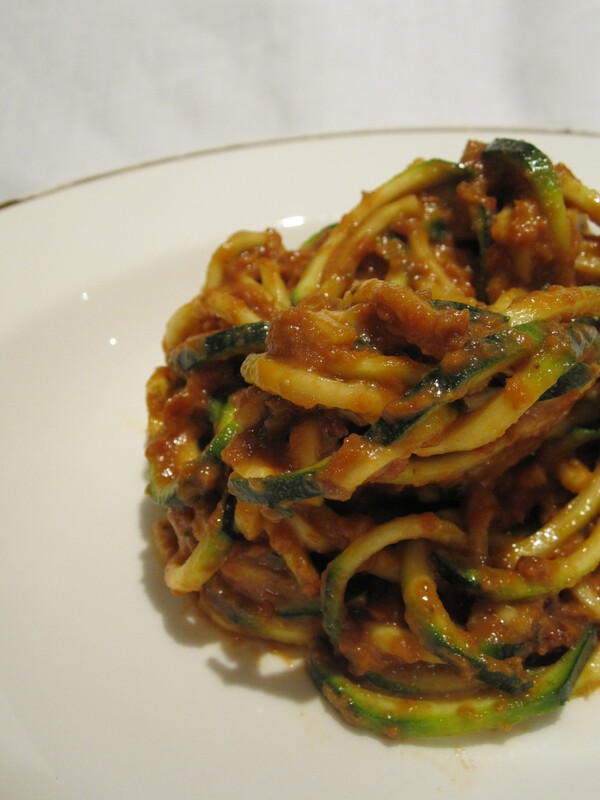 Toss the marinara sauce with your spiral zucchini or pasta and serve. Yummy and very popular with the WHOLE family!